AUTO【V】: Limit Break 4 (This ability is active if you have four or more damage): When this unit attacks a vanguard, this unit gets Power +5000 until end of that battle. 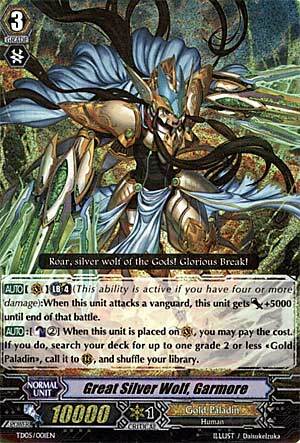 AUTO【V】: [Choose one of your «Great Nature» rear-guards, and retire it] When this unit's attack hits a vanguard, you may pay the cost. If you do, choose up to one «Great Nature» from your hand, and call it to Rear-guard Circle. There's a reason why Bushiroad put the word "Great" in this card's name...though personally, I would've went with "Awesome" or "Excellent", and even then, that wouldn't be able to describe how good this card is! There's a reason why people still run this trial deck card in their Gold Paladin decks to this day. The ability to call ANY Grade 2 or less Gold Paladin unit for 2 Counterblast gives you so many different possibilities! Got little to no cards in hand? Call a Dindrane or Silver Fang Witch and draw a card! Need more units on the field? Call Lop Ear Shooter and use his skill to get 2 better units! Need a booster? Call Gareth, Nimue, Sleygal Dagger or even Charjgal! This card turns your entire deck into a toolbox! I would also go into detail about his Limit Break, but seeing how I've already talked about it as many times as I have this past week, I think it's best to not sound like a broken record and say that it's an excellent skill to go along with his toolbox ability as it can have him search for Charjgal and make him a combined 26000 pre-Drive Check after all effects are resolved! This would force either 20000 worth of shield from a non-Majesty Lord Blaster or Crossride, and even then, it still forces out 15000 worth of shield against them! The reason I never mentioned this with the other cards I reviewed these past few days is because Garmore can get his buddy booster the easiest of any of these cards this week! In short, Garmore is an excellent card whether you're a beginner or a veteran. And now we have Garmore. The first, and probably the most versatile, Gold Paladin grade 3 vanguard short of the Liberators. When ridden, counterblast 2, and call a grade 2 or lower Gold Paladin from your deck. This guy is, I believe, the biggest reason for the surge of popularity of the Gold Paladins upon their release. The ability to retrieve whatever unit you need from the deck is exceptionally powerful. Need some power? Get Beaumains. Need some pressure? Get Viviane. Need to swing for huge numbers? Get Charjgal. I mention the latter with particular voracity. All of the cards reviewed this week have a unique booster that, when combined with the limit break, allow the vanguard to swing for 26k. In the case of Garmore, that booster is SEARCHABLE. That’s tremendously powerful. Setting up a 21k column should be an ideal situation in any deck, and the ability to set it up simply by riding your grade 3 is amazing. But wait, there’s more. Garmore has a place in every current build of Gold Paladins. His skill will trigger the skills of the bunny patrol (Lop Ear Shooter, Dindrane, and Pellinore) allowing you to build your field using more options than just what is in your hand. The limit break is just gravy. Garmore allows some of the most consistent comeback power plays in the game, bringing himself to the party, and whatever else you need. Whether you are building the deck to ride him as the main vanguard, or he’s just in there as a backup in case you didn’t draw your Ezel or Spectral Duke, Garmore definitely has a place in every Gold Paladin deck. Rating: 5/5 – Definitely an upgrade to his Royal Paladin counterpart.